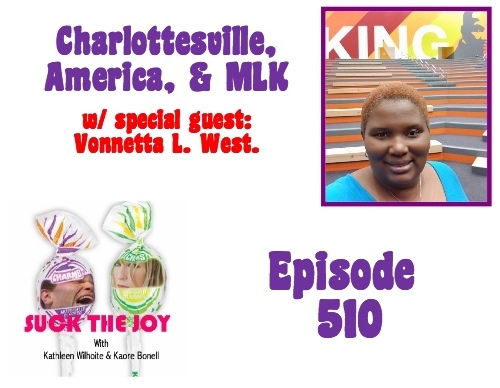 This week we are joined by Vonnetta L. West, currently the Director of Education Program at Points of Light in Atlanta. She is a student of the teachings of Dr. Martin Luther King, Jr. and has facilitated workshops & trainings derived from his teachings for over 10 years. In the wake of the horrific events in Charlottesville this past weekend, we begin to discuss the state of racism in America, for those who are confronted with it every day, and for those who are shocked by the reality of what they are seeing unfold on their TVs. How do we talk about race in America? How do we take advantage of teachable moments? Why has slavery been so sanitized in our history? We only scratch the surface, but we’re lucky we get to do it with Vonnetta!